This audition is officially closed. Click here to see the audition result. Thank you to all who auditioned! Previous theatre experience is preferred, although not necessary. You will not need to prepare anything before the audition - just show up! In preparation for the production, you will need to be available for two rehearsals a week (evenings/weekends), so please only audition if you can commit your time to these rehearsals. Break a leg! 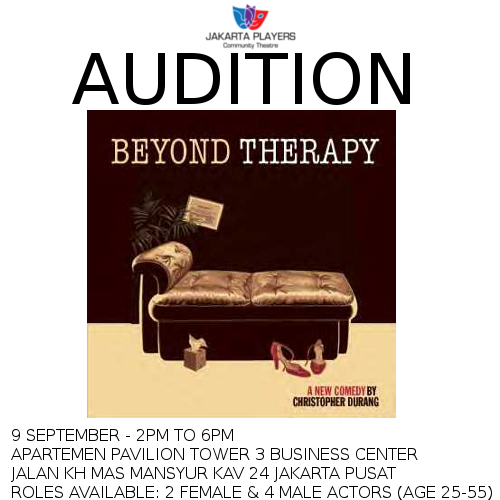 Please fill out the form below or send an email to thejakartaplayers@gmail.com stating your intention to audition and for which role(s).